It used to be that Hollywood studios were bought by corporate conglomerates; now, the corporate conglomerates that own the studios are the ones being bought. DOJ: Actually, I think we might appeal this ruling. Oh, damn. That really messes up the flow of the song. Let’s put in a pin in that for now. In truth, as of this writing, the DOJ has not formally appealed the ruling. Their lawyers on the case have kicked the dirt in frustration and flashed ugly faces at AT&T CEO Randall Stephenson and Time Warner in anger, sure, but they haven’t officially moved to put a stay on the ruling. 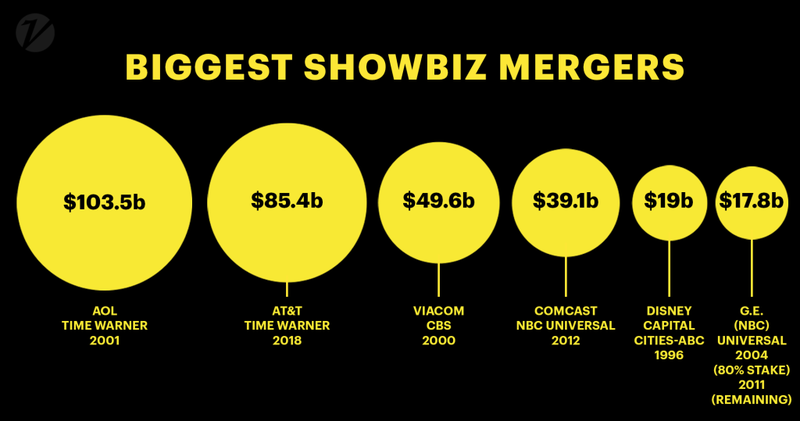 Lacking that, AT&T and Time Warner will officially merge a week from now (6/18), thus initiating a likely run of media mergers and acquisitions on a scale and volume we’ve never seen before. It’s not just that Judge Leon approved the deal and rejected the DOJ’s argument that combining the second largest telecommunications company and the biggest pay-TV provider with one of the country’s leading film and television studio will be bad for consumers; it that’s he approved it all without conditions. 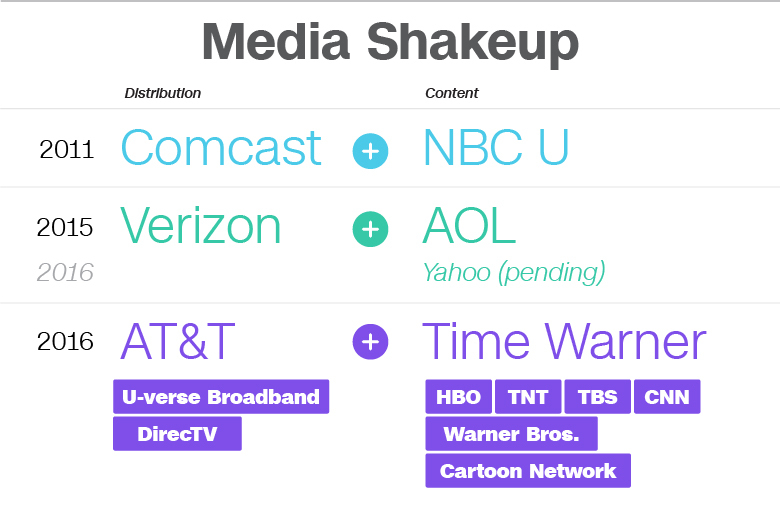 Time Warner doesn’t have to sell CNN or other cable properties to slim down; AT&T doesn’t have to sell DirectTV. Nope – everything’s even Steven. That the only way for a media company to survive in an environment increasingly dominated by technology giants is by combining movie studios, TV channels, distribution and data into one corporation. But, why is this happening? According to The Globe, $816 billion worth of company consolidations/mergers have been announced in the United States through May, a 71% percent increase from a year ago. The reason: Companies need growth, and buying other companies remains one of the fastest and most effective ways to achieve it. Despite recent interest rate increases by the Federal Reserve, borrowing the vast sums of money needed for deal-making remains cheap by historical standards. As for why exactly it’s hitting the media industry so hard, the answer is simple: tech disruptors. Everyone’s terrified of Amazon, Apple, and Netflix’s collective assault on cable, and Facebook and Google are soaking up all of the ad dollars. That directly targets both of the revenue sources for traditional TV companies. So, if Netflix triumphs by going direct to consumers with its own content AT&T can follow suit by now owning all of the content on HBO, Cinemax, CNN, TBS, TNT, truTV, TCM, Cartoon Network, The CW (well, technically CBS still owns half the network) along with any and all movies made by Warner Bros. Moreover, Disney can gobble up all of Fox’s assets to both boost Hulu, which it would become a majority owner of, and prop up its forthcoming streaming service/aspiring Netflix-killer. Isn’t this usually a bad thing for consumers, though? Merging companies always swear this will be better for business and thus for consumers, and then they raise prices because, well, there’s not as much competition anymore. Look at what happened when Comcast bought NBC/Universal. They said they wouldn’t withhold NBC programming from rival cable companies or other competitors, but that’s exactly what they’ve allegedly done. Still, this is a free-marketers dream. This ruling, as The Wall Street Journal pointed out, effectively “pushes the government to the sidelines and encourages media, tech and telecom companies to find partners to compete against Silicon Valley.” If the big tech companies represent a clear and present danger to traditional media, it’s up to the market to consolidate and fight back. We just might be the ones left paying the bill. Honestly, is this judge stupid or bought? Approving the merger is one thing (and I wouldn’t have done it, the whole Comcast/Universal/NBC business already shows which this construct is a bad idea), doing it without any conditions is beyond the pale. I hope the DOJ appeals and is successful with it. But what I don’t get is that everyone seems to be crying murder over the notion of Disney buying Fox as if this is the end of the industry while mergers which are way, way more dangerous are waved through or even cheered on. Just..what?